I wish I could say that fish tacos are a favorite meal in our house. Unfortunately, I have a few fish-haters who refuse to like any kind of seafood. Even when, as in this case, the fish is extremely mild, “unfishy” and full of flavors they already enjoy. But I love them, so I continue to cook them for those of us who appreciate a change from your standard ground beef taco. The others eat the beans and cabbage drowned in the delicious cilantro dressing. In the summer, I would add fresh homegrown tomatoes to these tacos. After growing my own tomatoes, however, I have a real aversion to grocery store tomatoes. They are always mushy or mealy, regardless of how red and beautiful they appear. So I will wait for summer to add them. I like to use Cotija cheese in these tacos. Cotija is a firm mild cheese with a texture similar to feta, but without the saltiness. It crumbles easily with your fingers. Cabbage is also a must in fish tacos. The crunchiness of the cabbage makes a great contrast to the soft texture of the fish. I serve these with a creamy cilantro dressing. It is full of cilantro, and just barely spicy. You can adjust the heat by varying the amount of jalapeno and Sriracha sauce in the dressing. I often make a double batch of the dressing and use it later as a salad dressing or raw vegetable dip. Prepare cilantro dressing: Place all dressing ingredients in a blender or food processor and blend until smooth. Refrigerate for about one hour. Use any leftover lime juice to mix with a can of drained and rinsed black beans. Remove fish from refrigerator about 30 minutes before cooking. Mix dry spices in a small bowl. Pat fish fillets dry and rub spices onto both sides of fish fillets. Heat oil in a cast iron skillet over medium-high heat. Place fish fillets in the hot skillet and sear until cooked through (do not crowd pan; cook in 2 batches if necessary). Depending on the thickness and variety of fish, it should take about 3 minutes per side. Check for doneness with a fork: fish should flake easily, but not fall apart. Remove from pan and let fish rest for 2-3 minutes. Use a fork to separate fish into 2-3 pieces. 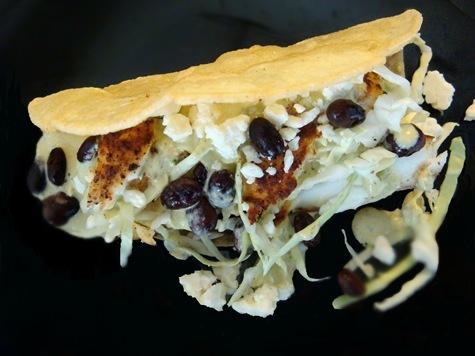 Serve fish strips in warm tortillas with shredded cabbage, tomatoes, Cotija cheese, black beans and cilantro dressing. Easy prep, easy cooking, easy clean-up, and ready to eat in under 30 minutes, start to finish (even if your shrimp are frozen). Simple enough for a quick mid-week meal, but elegant enough to serve to company. This is a recipe that I adapted from Kalyn’s Kitchen. I had bought some Szechuan peppercorns from Penzeys and thought that this would be a great recipe to add them to. Szechuan peppercorns are not spicy in the same way that some other hot peppers are. Rather than a burning feeling, they produce kind of a “numbing” sensation on your tongue. But when used sparingly, they add a great flavor! To save on clean up, I like to prepare this recipe using Ziploc bags and a foil lined roasting pan. 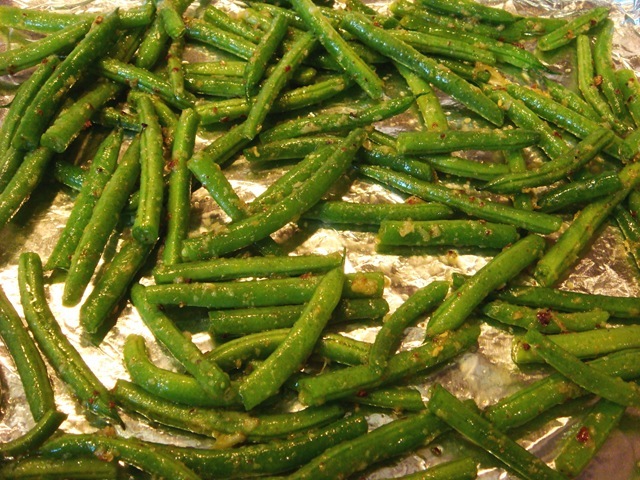 Combine fresh green beans with a little olive oil, coriander, cumin and ground Szechuan peppercorns (you could also use red pepper flakes or other spicy pepper if you don’t have the Szechuan ones). To save on time, I bought raw, peeled shrimp (they still had tails, and I left them on). To thaw frozen shrimp, place them in a colander and run cool water over them until thaw. 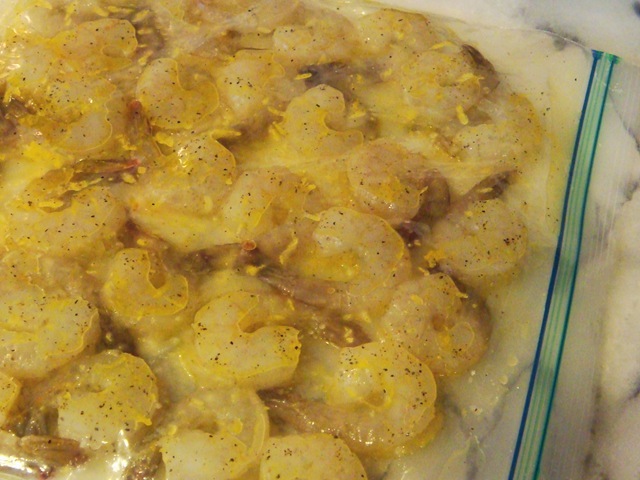 Combine shrimp with olive oil, lemon zest and salt and pepper. Arrange beans on a foil-lined pan in a single layer . Roast beans at 425°F for 5 minutes. 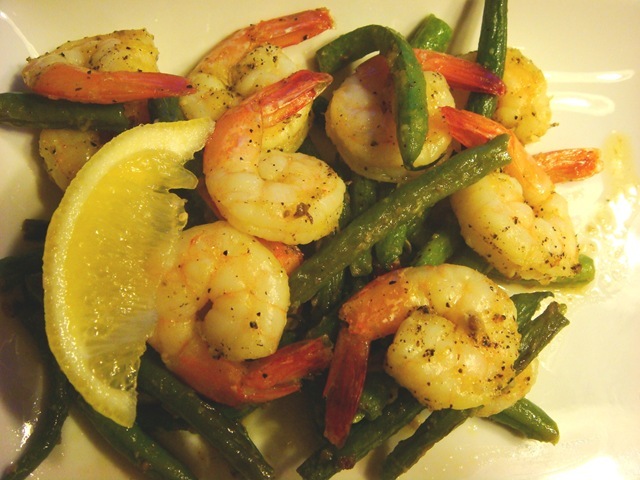 After 5 minutes, arrange shrimp on top of beans and roast 8-10 minutes more, until shrimp are done but still tender and juicy. Serve with lemon wedges. 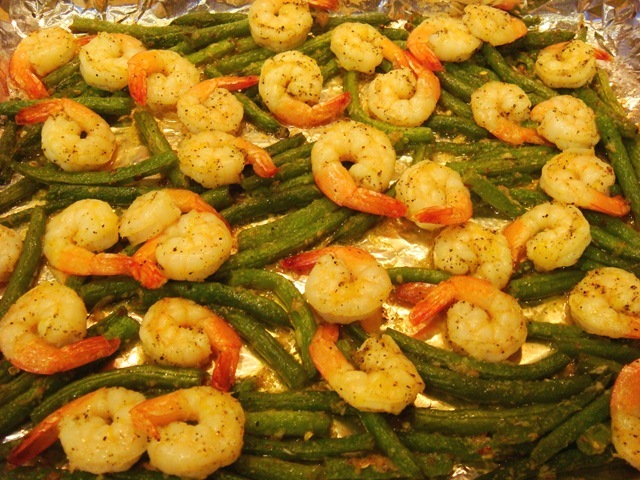 If shrimp are frozen, place in a colander and rinse with cool water until thawed. Peel and devein. Grind whole Szechuan peppercorns (I use my regular black pepper grinder). 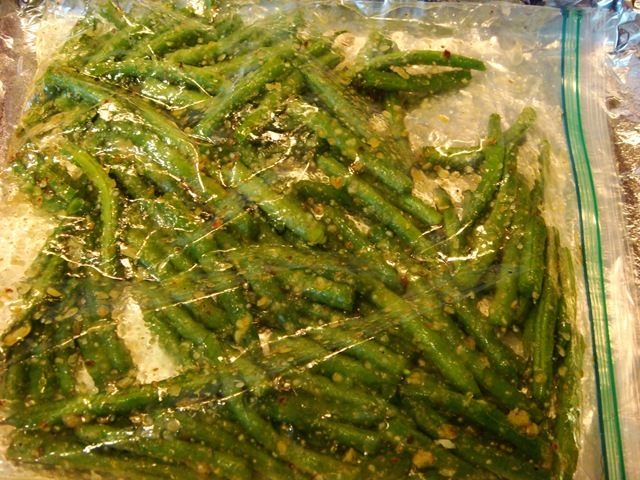 Place with green beans in a Ziploc bag with remaining “green bean” ingredients. Combine shrimp and remaining “shrimp” ingredients in a separate Ziploc bag. Reserve lemon wedges for later. Line a roasting pan with foil. Spray with non-stick cooking spray. Arrange beans on pan in a single layer as much as possible. Roast beans at 425°F for 5 minutes. 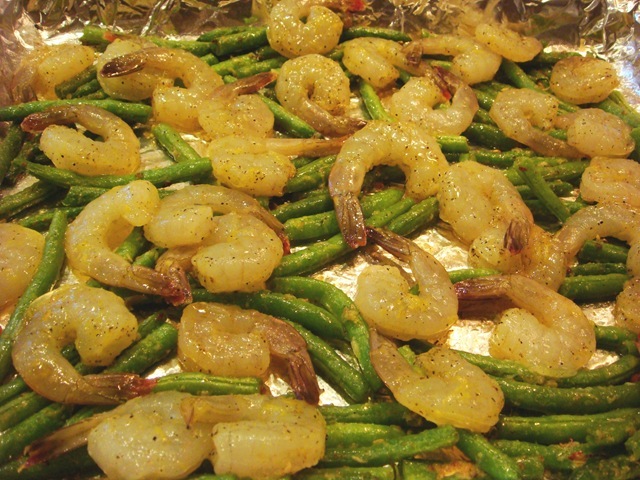 After 5 minutes, arrange shrimp on top of beans and roast 8-10 minutes more, until shrimp are done but still tender and juicy. 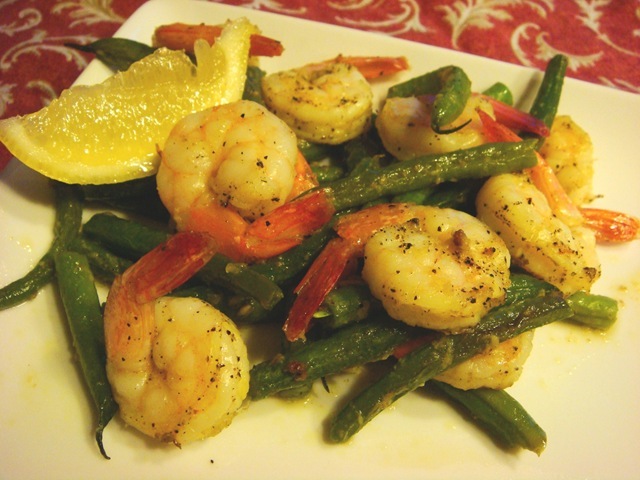 Serve the shrimp and beans immediately with lemon wedges. **NOTE: If you don’t have Szechuan peppercorns, you can substitute crushed red pepper flakes, or other hot peppers. I get my peppercorns from Penzeys. These can actually be as spicy or not-so-spicy as your family likes. 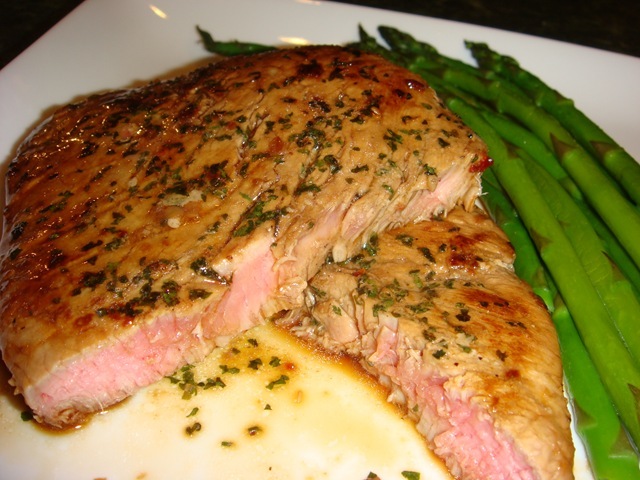 Fresh tuna steaks are marinated in a flavorful soy sauce based sauce and then quickly seared just before serving. Super easy. Super fast. Super delicious. Plus NO prep bowls to clean! Just one pan to clean and one Ziploc bag to throw away. The marinade includes lime and soy sauce, ginger and garlic, chili paste (which can be adjusted to taste) and cilantro. 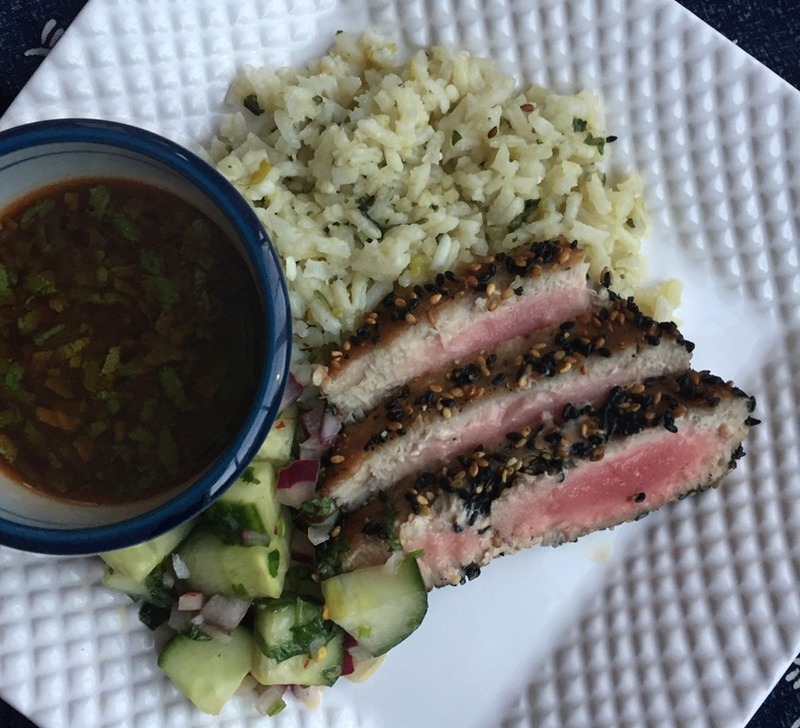 Tuna is a drier fish, so the marinade also contains quite a lot of oil, but the marinade is drained off before cooking, so you don’t actually eat all of that oil. But it will keep your fish nice and moist. Tuna is best eaten on the rare side. It is so much more tender and flavorful that way. Nothing at all like dry tuna out of a can. 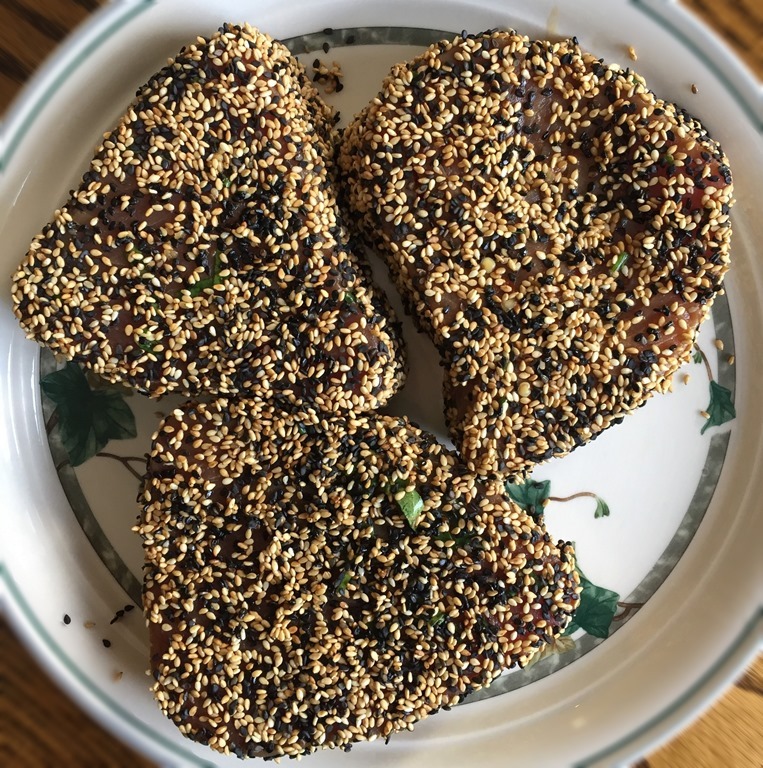 Marinate your fish in a Ziploc bag or shallow dish at room temperature for 30-40 minutes before you plan on eating (or prepare it earlier in the day and place in the refrigerator. Remove from fridge 30 minutes before you plan on cooking it). This cooks very fast-only about 5 minutes total, so have your side dishes ready before you begin searing. To cook, heat a skillet over medium-high to high heat. 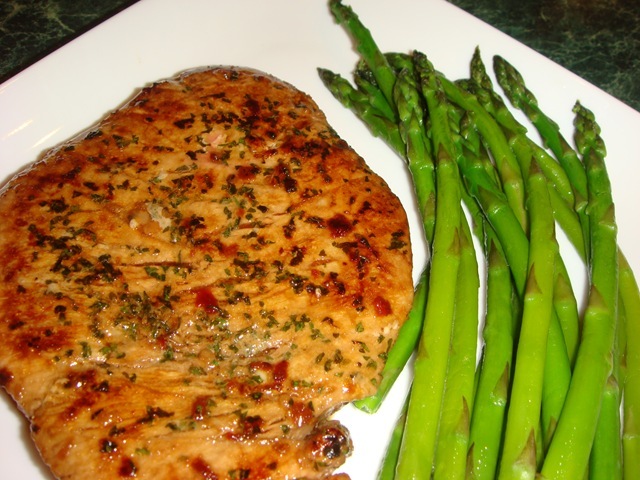 Don’t add any oil; the marinade has plenty of that! Remove fish from marinade, draining off as much of the marinade as possible. Add tuna steaks to the hot pan and cook 3 minutes on the first side and 2 minutes on the second side. You can cover the pan to reduce splattering, if you like. Tuna will be cooked about ¼” through, and rare in middle. Increase cooking time if you want it cooked a little more, but don’t overcook; it will quickly become dry. Combine all ingredients in a Ziploc bag. Marinate for 30 minutes at room temperature, or up to 2 hours in refrigerator (remove from fridge 30 minutes before cooking). Heat pan on medium-high heat. 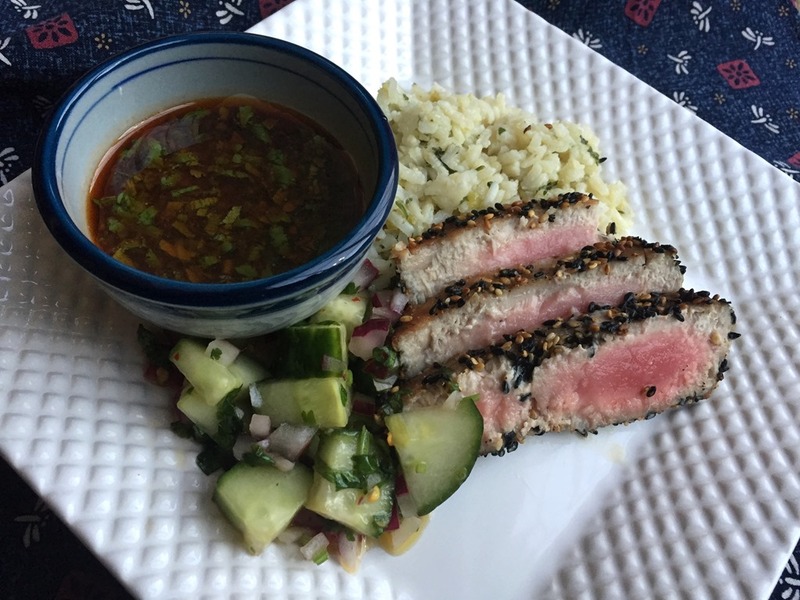 Remove tuna from marinade. 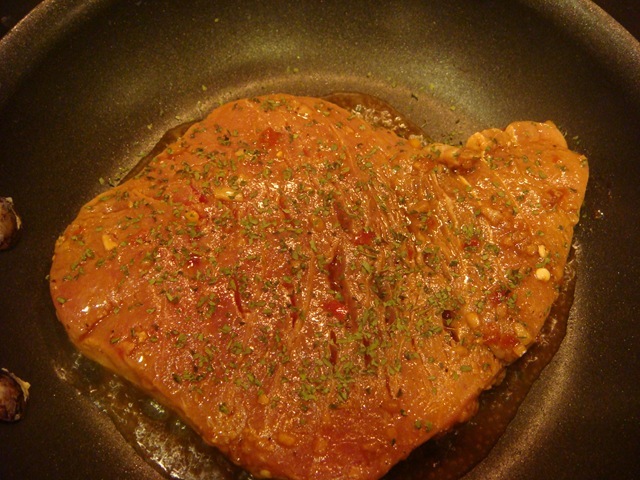 Add tuna steaks to pan and cook 3 minutes on one side and 2 minutes on the 2nd side (cover to reduce splattering). Tuna will be cooked about ¼” around, and rare in middle.